What changes will make the 2020 Acura RDX different? Likely very little beyond a new paint shade or two — and higher asking prices. Model-year 2020 is the sophomore season for a premium compact crossover SUV that was fully redesigned for model-year 2019. This third-generation RDX is larger, faster, more fuel-efficient and better looking than its 2013-2018 predecessor. And it no longer shares its understructure with the less prestigious CR-V crossover from Acura’s parent company, Honda. The original RDX launched for 2007, borrowing much of its underskin engineering from the CR-V. Its underwhelming turbocharged four-cylinder engine and surprising lack of refinement didn’t win much favor with press or public. The first-generation RDX never sold more than 30,000 units annually over the course of its six-year production run. That changed with the second generation and its more refined styling, improved passenger and cargo room, and smooth, powerful V-6. Sales were brisk out of the gate and remained strong, regularly topping 50,000. Helped by prices generally below those of most top rivals, the redesigned model seems to be continuing that success. The 2019 broke all previous RDX sales records in June 2018, its first month in showrooms. It’s Acura’s best-selling vehicle and ranked No. 1 in the premium compact-crossover class in June, ahead of such competitors as the Audi Q5, Mercedes-Benz GLC, Cadillac XT5, and BMW X3. This in a segment experiencing double-digit growth. Why should I wait for the 2020? You probably shouldn’t. Strong demand suggests Acura got this one right and won’t have much incentive to tamper with it for 2020. It also suggests Acura won’t be shy about increasing prices for a crossover that’ll essentially be a rerun of the 2019 version. The 2020 lineup should reprise a base RDX available with three extra-cost option packages: Technology, A-Spec, and Advance. Per Honda/Acura custom, each package is priced as a separate model. The sole engine would remain a turbocharged four-cylinder paired with your choice of front-wheel drive or Acura’s Super-Handling All-Wheel Drive (SH-AWD). Should I buy a 2019 model instead? Definitely. The 2019 RDX improves on its predecessor in nearly every way. The exterior is contemporary, the interior more comfortable and more technologically advanced, and the driving experience as engaging as ever. Combined with pricing that can undercut its competition by thousands of dollars and Acura’s reputation for reliability and strong resale values, and the RDX shouldn’t have any trouble maintaining its sales pace. No. It’ll reprise the look that came on line with the 2019 redesign. Relative to its predecessor, this third-gen RDX is 2.6 inches longer in wheelbase (the distance between the front and rear axles), 2.4 inches longer overall, and 1.1 inches wider. It was the first Acura vehicle to adopt the brand’s latest exterior and interior design language. The nose sports the same inverted pentagonal grille you’ll find on the TLX sedan and the MDX midsize crossover but we’d argue the new grille works best here. The RDX was designed with it while the TLX and MDX had theirs added as part of midcycle updates; on them it seems “tacked on” rather than smoothly integrated with the bodywork. All ’20 RDXs will again include LED headlights with Acura’s Jewel Eye pattern that lends a dose of class. More angular body panels overall give the new RDX an aggressive stance absent before. It looks particularly bold with the A-Spec Package, which includes gloss black exterior accents and 20-inch “shark gray” wheels. Inside, Acura seems to have finally found the right balance between physical buttons and on-screen controls for climate and audio/infotainment. Instrumentation is clear, and while a multitude of buttons and dials makes the steering wheel look busy you’ll acclimate quickly because of their logical layout. All grades have a 10.2-inch widescreen infotainment-system display set tablet-style atop the center of dashboard. It’s not a touchscreen. Rather, you control the display from a laptop-like trackpad on the center console. Its main innovation is a feature Acura calls absolute positioning: put your finger on any portion of the trackpad and the cursor instantly moves to the corresponding location on the screen. It’s very intuitive, and the screen is wide enough to clearly display a range of infotainment, navigation, and vehicle data simultaneously. Transmission gear selection is via a series of console-mounted buttons instead of a traditional lever. It requires some concentration at first, but the advantage is room for a storage area beneath the console. The bin complements a nicely sized glovebox, a conventional center-console box, and generously sized door pockets. Surprisingly, the redesign’s wheelbase stretch didn’t result in significantly more passenger space, but that doesn’t mean the cabin is cramped. Room is abundant front and rear and the seats are comfortable and supportive. Maximum cargo volume shrunk slightly in the redesign, to 58.9 cubic feet, from 61.3, with the rear seat folded. However, space behind the rear seat increased to 29.5 cubic feet from 26.1 and is supplemented by an underfloor box in the luggage area. Not for 2020. Rather than sharing its basic platform with a mainstream Honda product, the 2019 RDX adopted a unique underskin structure with levels of refinement and rigidity suited to its upscale positioning. It does borrow from its parent company a version of the turbocharged 2.0-liter four-cylinder engine found in the Accord and sporty Civic Si compact car. In the RDX, it produces 272 horsepower and 280 pound-feet of torque and pairs with a 10-speed automatic transmission. It replaces the second-generation RDX’s 3.5-liter V-6, which had 279 horsepower and 252 pound-feet of torque and linked to a 6-speed automatic transmission. Most premium compact crossovers now use a 2.0-liter turbo four as their base engine and the RDX matches any for smoothness and response. Acceleration is more than competitive, at around 5.7 seconds 0-60 mpg, and this engine doesn’t feel strained when passing or merging with fast-moving traffic. Augmented by standard steering-wheel paddle shifters, the 10-speed automatic is a great match for the turbo four, allowing it to stay in its ideal power band and kicking down promptly when you require more zip. Handling is also quite good, with precise steering feel and minimal body lean in fast turns. Even if you don’t live where it snows, SH-AWD is a worthwhile investment because it markedly improves handling on both dry and wet surfaces. Operating normally in front-wheel drive, the system can shift up to 70 percent of available torque to the rear for better traction off the line or quell front-tire slip. It can automatically distribute up to 100 percent of that torque to either of the individual rear wheels, bolstering cornering prowess in most any situation. A console dial controls the standard Integrated Dynamics System, allowing the driver to select from among four pre-programmed throttle and transmission modes — Snow, Comfort, Sport, and Sport+ — depending on driving needs and conditions. Integrated Dynamics can also alter the active dampening suspension that’s included with the Advance Package. Ride quality is firm but not too taut. We’d like to sample an RDX on 18-inch wheels and tires rather than this one’s standard 19-inchers. The A-Spec Package includes 20s and lower-profile tires, potentially erasing what absorbency the 19s do have over sharp ridges and ruts. Try before you buy. Almost certainly not. Expect EPA ratings to repeat those of the ’19 model, which were about average for premium compact crossovers with 2.0-liter turbo fours. Compared with its V-6 predecessor, the redesigned RDX got a boost in fuel economy, though not as much as might have been expected. Its 2018 ratings were 22/28/24 mpg city/highway/combined with front-wheel drive and 21/27/23 with AWD. The A-Spec Package’s 20-inch wheels contribute to lower ratings of 22/27/24 mpg with front drive and 21/26/23 with AWD. 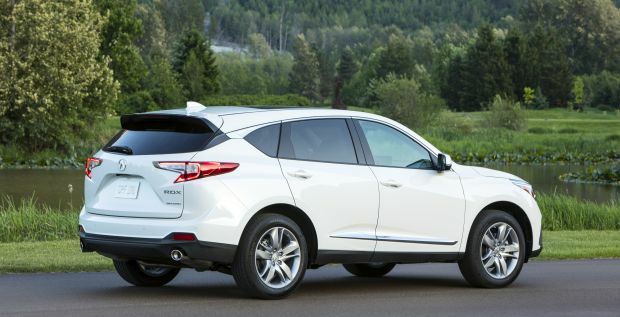 (The V-6-powered 2018 RDX rated 20/28/23 mpg with front drive and 19/27/22 with AWD.) Acura recommends premium-grade 91-octane gasoline for the RDX. Unlikely. The third-generation RDX carries over Acura’s tradition of a high level of standard equipment for the money and that’ll continue for 2020. Expect the Base grade to again come with dual-zone automatic climate control, keyless access with pushbutton ignition, sport bucket seats with convincing leatherette upholstery, heated front seats, a 12-way power driver’s seat, a power rear liftgate, genuine aluminum interior trim, a panoramic sunroof, the 10.2-inch infotainment screen, CarPlay, Android Auto, and a multi-angle rearview camera. Standard safety features include forward collision warning with autonomous emergency braking that can stop the RDX automatically to avoid a frontal collision, lane-departure warning with automatic steering correction, and adaptive cruise control to maintain a set distance from traffic ahead. For 2020, the Technology Package should again add front- and rear-obstacle detection, blind-spot and rear cross-traffic detection, leather upholstery, an imbedded navigation system, Acura’s excellent ELS audio system with 12 speakers, two USB charging ports for rear-seat occupants, and AcuraLink telematics. In addition to its exterior appearance upgrades, the A-Spec Package should again add ventilated front seats, a 16-speaker ELS audio system, suede-trimmed upholstery, a unique steering wheel, a black headliner, red instrument panel lighting, and sport pedals. Expect the Advance Package to also include ventilated seats and the 16-speaker audio upgrade for 2020, along with the adaptive suspension, rain-sensing windshield wipers, hands-free operation for the power liftgate, LED fog lights, extra sound insulation for the front side windows, a rear camera washer, a head-up instrument display, 16-way power adjustable front seats, heated outboard rear seats, genuine wood trim, and surround-view camera. For 2019, you had to order the Technology Package to add either the A-Spec or Advance package, but they could not be ordered together. Perhaps Acura will rethink that policy for the 2020 RDX. They’ll likely increase, although expect the ’20 RDX to remain priced several thousand dollars below similarly packaged European-brand rivals. The gap can grow more pronounced as you option competitors to match the RDX’s level of standard features. Most rivals are also available with far more powerful engine upgrades – you can get a 469-horsepower Mercedes GLC, for example. And whether you consider Acura a true luxury brand may determine if it pegs your prestige meter. Estimated prices here include Acura’s destination fee, which was $995 for the 2019 RDX. And add $2,000 to our estimates for AWD. 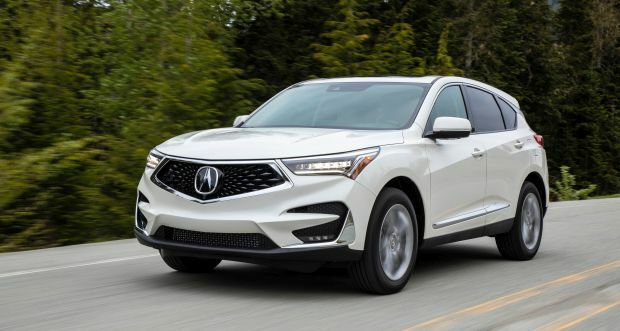 Figure the 2020 RDX with front-wheel drive to be priced around $38,600. With Technology Package, figure around $41,800 and with the A-Spec Package, around $44,800. Estimated price for the ’20 RDX with Advance Package is $46,700. Apt to continue as the most popular configuration, and our pick for best value, is an RDX with AWD and the Technology Package. Expected release date for the 2020 RDX is during summer 2019. Alfa Romeo Stelvio, Audi Q5, BMW X3, Buick Envision, Cadillac XT5, Infiniti QX50, Jaguar F-Pace, Land Rover Discovery Sport, Range Rover Velar, Lincoln MKC, Mercedes-Benz GLC, Porsche Macan, Volvo XC60. Blind-spot and rear cross-traffic detection as standard across the board. At least the 2019 model’s Technology Package that includes these driver aids isn’t terribly expensive and adds other worthwhile convenience features.